Tech Athletics continued to solidify itself with expanding media partnerships and hirings within the radio team over the summer to cover major sports broadcasts in the future. WYAY-FM “All News 106.7” will remain the Georgia Tech radio flagship heard throughout most of the state of Georgia. But through its multimedia right’s holder, IMG college, Athletics has also joined forces with Dickey Broadcasting Company for a promotional and entertainment partnership through its multimedia. This gives Tech fans another opportunity to hear programming that highlights a large span of Georgia Tech Athletics on 680 The Fan, which simulcasts on 93.7 FM, as well as The Fan’s sister stations 1230 The Fan 2 (1230 AM) and 1340 The Fan 3 (1340 AM). This new affiliation with Dickey Broadcasting company will compliment IMG’s agreement with Cumulus Media’s WYAY-FM (106.7), as The Fan will air weekly Monday night shows of football coach Paul Johnson and men’s basketball coach Brian Gregory. Both also air on 106.7 FM on a tape-delayed basis each week on Mondays at 9 p.m. or live on Mondays at 7 p.m. when 680 The Fan is airing Atlanta Braves Programming. The radio stations will also broadcast a weekly interview show with Mike Bobinski, which will include exclusive content for Yellow Jacket fans. “Our partnership with the Dickey Broadcasting Company and its family of radio stations gives us some flexibility and enhances our presence in one of the nation’s largest media markets,” Bobinski said. The radio broadcast team is also welcoming a new addition as they prepare for a larger radio presence with Brandon Gaudin being named the “Voice of the Yellow Jackets” by Mike Bobinski. Coming from being the play-by-play announcer at Butler University, Gaudin is taking on the role of the play-by-play announcer on the Georgia Tech/IMG Sports Audio Network, as well as host of Tech Athletics weekly radio shows and television productions. Gaudin will be joined in his gametime broadcasts by Rick Strom, who will be starting his sixth season as color analyst following three seasons as a sideline reporter. Strom played for the Jackets from 1983-87, and was the starting quarterback for 16 games over the 1986-87 season. 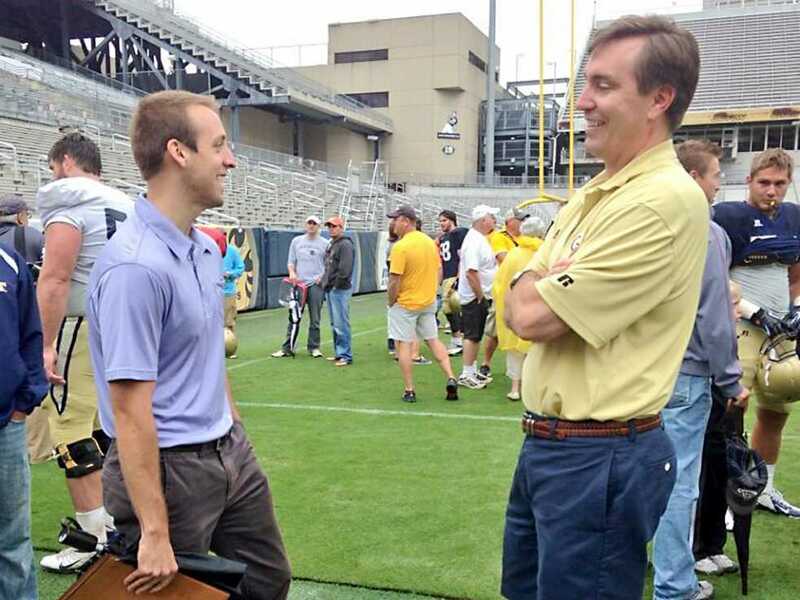 Randy Waters will also be returning as the co-host of “Yellow Jacket Countdown,” the one hour show that airs prior to every Georgia Tech football game and will also this season be fulfilling the roles of sideline reporter and host of the locker room show during the Post-game broadcast. Tech football games are also available on siriusxm.com, through an agreement between Sirius XM Satellite radio and the Atlantic Coast Conference.